Two men have been charged in the fatal shooting of off-duty Chicago Police Officer John Rivera. 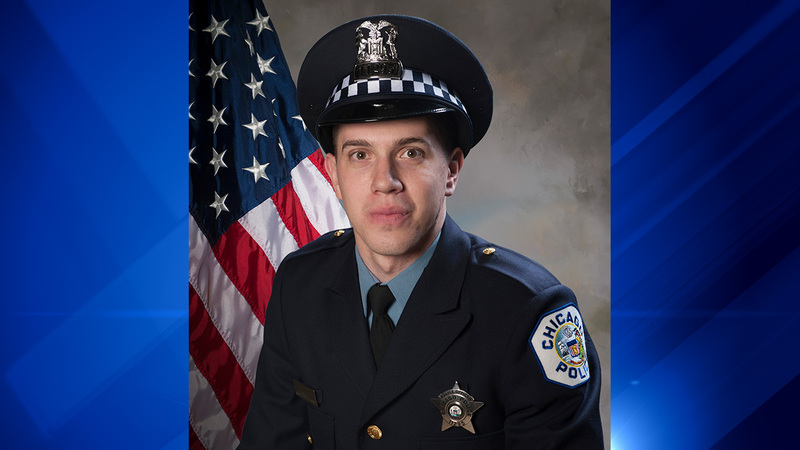 CHICAGO (WLS) -- Two men have been charged in the fatal shooting of off-duty Chicago Police Officer John Rivera, police announced Monday. Police said 24-year-old Menelik Jackson, of South Holland, and 32-year-old Jovan Battle, of Chicago, have each been charged with first-degree murder. Police said Jackson fired into a car Saturday in River North, killing Rivera and critically wounding another man. Battle was a co-conspirator, police said. Superintendent Eddie Johnson speaks after two men were charged int he shooting of an off-duty Chicago police officer. Jackson and Battle have each been charged with one count of first-degree murder and three counts of attempted first-degree murder. Jackson was also charged with resisting/obstructing a peace officer. A Cook County judge denied bail Monday afternoon, adding that it was one of the "most senseless and evil acts" he had ever heard of. Rivera, 23, was shot and killed early Saturday morning in River North following a night out with friends. Police said the shooting and aftermath was captured on police cameras and other cameras in the area. Prior to the shooting, police said they believe there was a dispute at McDonalds' flagship store -- formerly known as the "Rock 'N' Roll McDonald's" -- involving Jackson, another man and a number of Hispanic men on a party bus who were making fun of Jackson and the other man, police said. Police said Jackson left, got a gun and came back to the area and found the car with the off-duty Officer Rivera inside. Police said that Rivera and his companions had just gotten to their car after leaving the Stout Barrel House and Pizzeria. Believing that Rivera and the men in the car were part of the group on the party bus, police said Jackson opened fire on them. Police were able to track Jackson's car through witnesses and cameras and arrested him Sunday morning, police said. "In an act of cowardice, Mr. Jackson went to get a gun to settle this petty dispute, which resulted in him murdering the first Hispanic man that he came in contact with," Superintendent Eddie Johnson said at a press conference Monday morning. Hate crime charges may be filed, police said. Police said Jackson, who has a history of domestic violence arrests, has confessed to the crime. He had been wearing a GPS monitor up until two weeks ago. Battle also has an extensive criminal history, having been arrested 40 times since 2008. Police are still searching for the third man believed to be involved in the murder, Jackson's companion who was with him at the McDonald's. Officer Rivera shielded his girlfriend when shots were fired, police said. She was not injured. The person in the rear passenger's seat, who ABC7 Eyewitness News has learned is in the military reserves, was shot several times but is expected to survive. Officers used Rivera's handcuffs when taking Jackson into custody. Chicago Police Chief Communications Officer Anthony Guglielmi said Jackson was an applicant to be a police officer with CPD and was arrested during his background polygraph for committing an armed home invasion. He was given probation in exchange for a guilty plea. Jackson never made it any further than an applicant. "The most egregious part about him is that he actually once thought he had what it took to wear a Chicago police star," Johnson said. Johnson said his son, Daniel, served with Officer Rivera in the 6th District. "I can tell you firsthand that those officers over there are suffering right now," Johnson said. "They lost a friend and Chicago lost a young guardian who wanted nothing else but to dedicate his life to making the city he grew up in safer." Commander William Bradley, who heads the 6th District, said Rivera's only mission was to help people. "My third shift watch is really struggling because he was such a good person. Not only a good police officer, but a good person," he said. Visitation will be held 3 p.m. to 9 p.m. Thursday at Elmwood Chapel, 11200 S. Ewing Ave., Chicago.